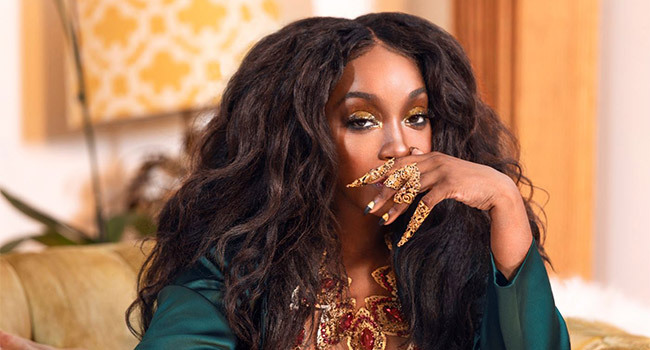 Grammy winner and R&B/Reggae artist Estelle rocked Brooklyn last week, when she kicked off her Experience Lovers’ Rock Live mini-tour at Baby’s All Right on Wednesday, February 6th. Bounding out into the tiny room at 9:30, Estelle’s commanding stage presence and versatile voice kept the audience in rapt attention for just over 90 minutes. During which time, she moved from song to song. While the concert featured many of Estelle’s hits, it leaned heavily on the new material from her most recent album, Lover’s Rock. Estelle either co-wrote all 14 tracks on the album. Lovers Rock refers to a type of music within the reggae genre. It’s no coincidence Estelle kicked off this mini-tour on what would have been the late Bob Marley’s 74th birthday. Estelle’s album focuses on romantic themes. She told the audience at Baby’s All Right that the album was inspired by her own parent’s love story. They got together, had three kids, broke up, married other people, and the found each other again. Throughout the show, Estelle moved effortlessly from the romantic overtures of her new pieces to the R&B-fueled anthems that people have come to know her for. To experience an Estelle concert is to an experience a world of paradoxes that come beautifully alive in the room: One minute she’s in the crowd pouring liquor into a red Solo cup; the next she’s dancing onstage with a college-aged fan of Steven Universe, the cartoon network megahit TV series on which she has played a main character for all five seasons. No matter where one’s knowledge of Estelle or her catalogue comes from, her show has something for everyone. Backed by only a three-piece band (keys, bass, and a DJ with full turntable), her show offered as full a sound as any. The computerization allowed her to loop, refrain, and call back to songs from earlier in the show. In a way, not having a five-piece band beholden to the strictures of live performance was very freeing. She chose the setlist as she (and the crowd) went. It is for this reason that I can’t tell you when she performed which song, because that was never the point. The point was to party. Of course, she saved her Grammy-winning hit, “American Boy” for last. Everyone in the crowd sang so nice, she played it twice. Or, at least, she let the crowd sing it all the way through acoustically, before playing it in earnest. Estelle’s ability to make a crowd have fun while feeling like they’re in on the show, is second to none. So powerful is Estelle in her crowd work, that for he final few songs she asked that everyone put their phones away. And the whole room listened. All Hail Garnet. (You SU fans will understand). Author’s Note: My thanks to Estelle’s team at VP Records, who accommodated this press request. My sincerest apologies to them and TMU readers for the delay in this article. I was out with the flu for the rest of last week and on bedrest through the weekend.